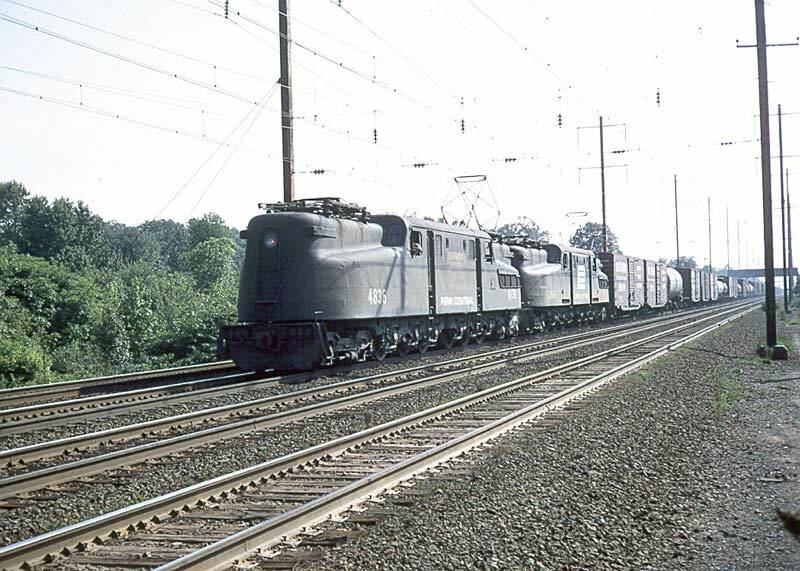 The New York to Philadelphia Main Line was an extremely busy piece of railroad in the Penn Central days, and it remains very busy today as part of Amtrak's Northeast Corridor. 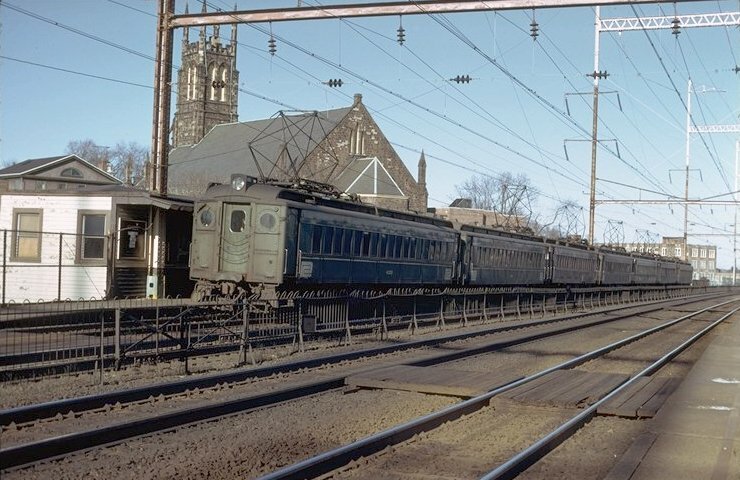 Where AEM7s and Acela Express trains run today was once the domain of Penn Central diesels and electrics, hauling both passengers and heavy freight tonnage. Harrison is across the Passaic River from Newark. For space reasons, Harrison has its own separate page. GG1 4876 pauses for a station stop under the train shed at Newark Penn Station. Photo by Pete Donner, from the collection of Joseph Testagrose. A westbound freight train rolls past Lane Tower in Newark, NJ. Lane controlled the entrance to Waverly Yard off of the ex-PRR main line. Photo by Harv Kahn. 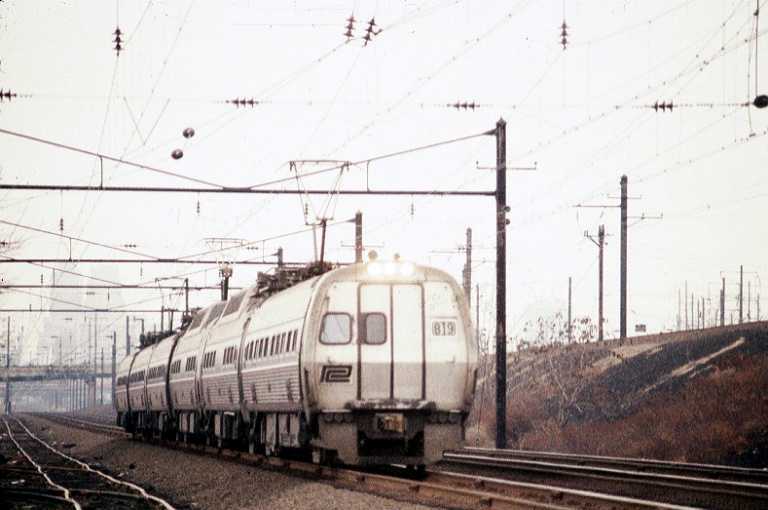 At the same location, another westbound rolls past Lane Tower, this one with a pair of E44 electrics for power. Photo by Harv Kahn. Looking the other direction at the same location, we see a Metroliner train approaching. Photo by Harv Kahn. 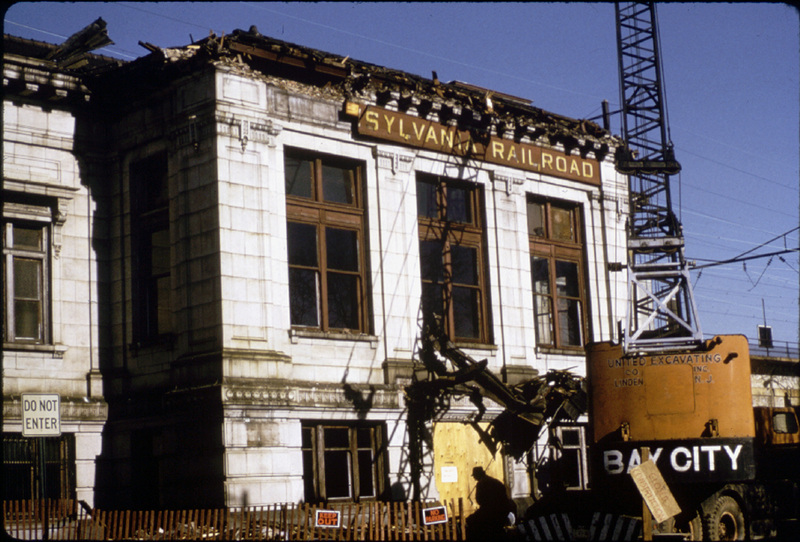 Elizabeth was, and still is, a very popular train-watching location on the Northeast Corridor. Elizabeth has its own separate page. Rahway is located on the Northeast Corridor about 20 miles out from Penn Station. The mainline here had the nickname "Six Roads", because the mainline is six tracks wide. 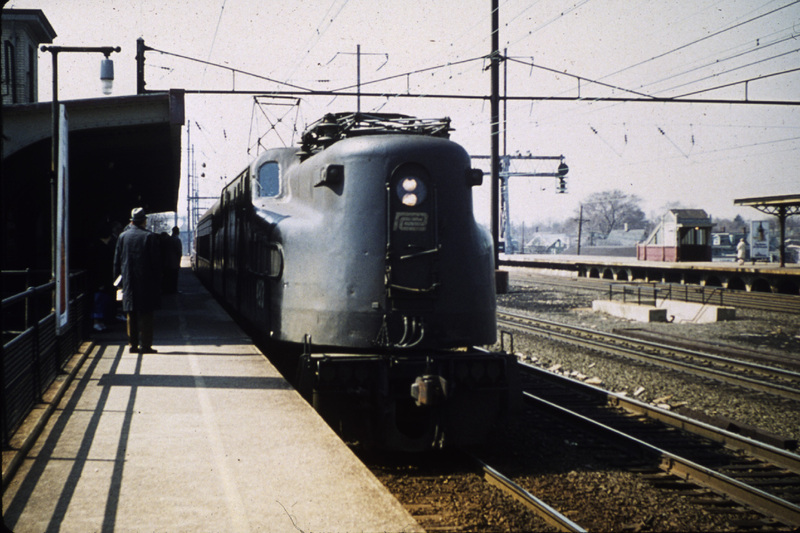 The two outside tracks branch off of the mainline at Union Tower, located a quarter-mile to the west, and form the PA&W Branch, which leads to South Amboy and the New York & Long Branch. A PC Alco and caboose pass the station while a GG1 approaches. Photo by Edward Gibbs, contributed by Jeff Jotz. 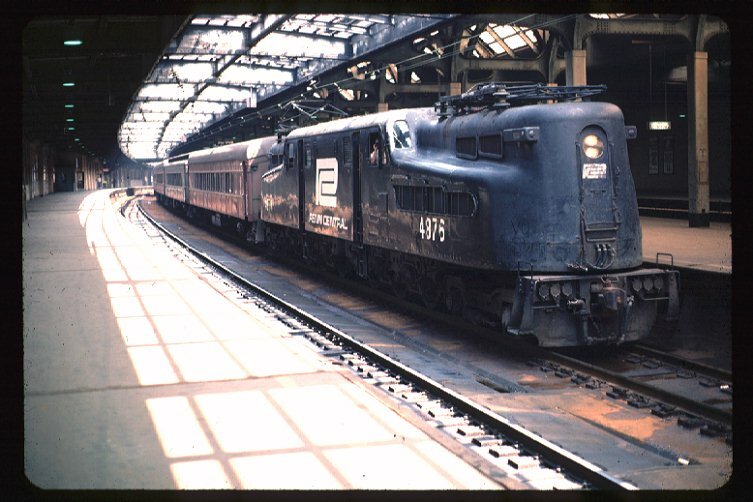 A passenger train with two GG1s passes. Photo by Andrea Vibbert, contributed by Jeff Jotz. A PC GG1, up close and personal. Photo by Andrea Vibbert, contributed by Jeff Jotz. Passenger train led by GG1 4913. Photo by Andrea Vibbert, contributed by Jeff Jotz. 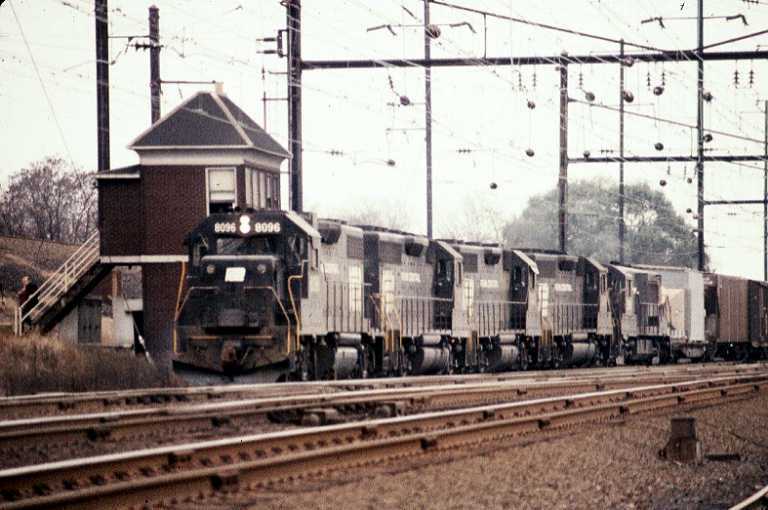 GG1 4865 and an undentified switcher lead a work train through Rahway on October 17, 1970. Photo by Joseph Testagrose. 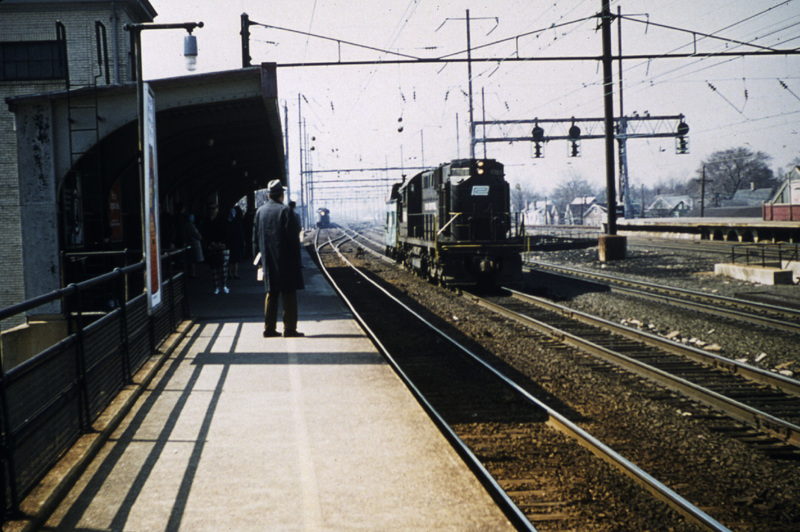 These are pictures of the former PRR station in Rahway, NJ. These photos were taken by Andrea Vibbert and contributed by Jeff Jotz. 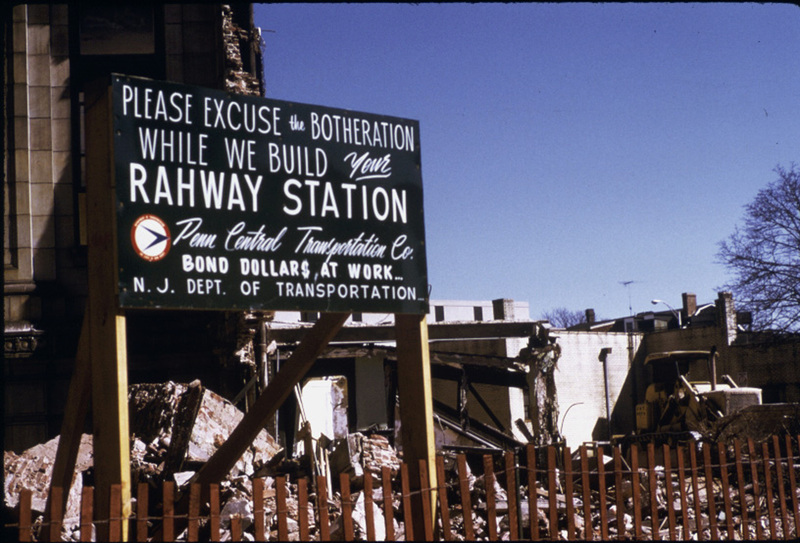 The demolition of the PRR station in Rahway, NJ. A sign at the the Rahway Station. 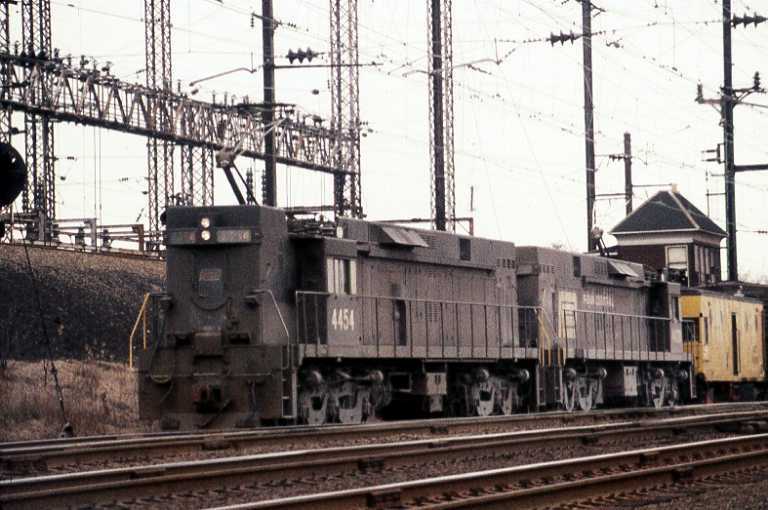 Thirty miles out from New York City, we find PC MP54 436 at New Brunswick, NJ, in February 1975. Photo by Ed McKirnon, from the collection of Joseph Testagrose. 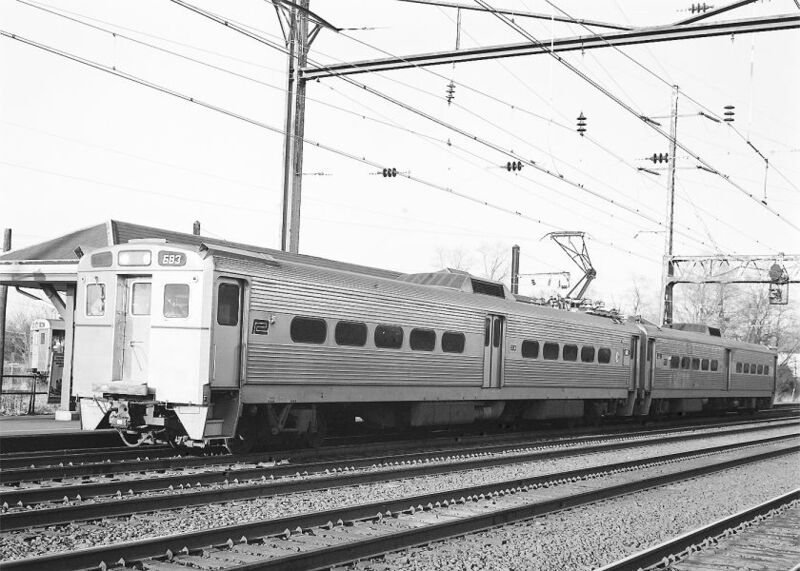 A pair of Arrow-II MU cars make a station stop at Princeton Junction. At the station, a branch left that main line which ran two miles to the city of Princeton, home of Princeton University. 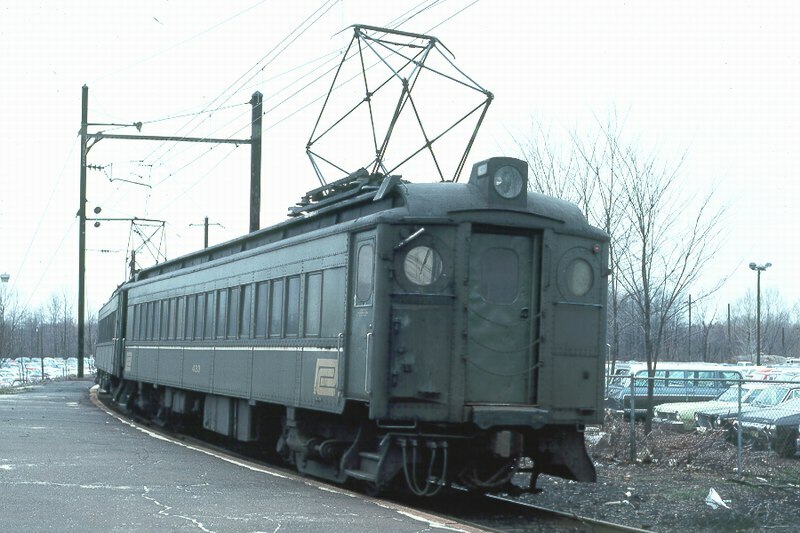 A single MU car, called the "dinky", shuttled back and forth between Princeton and Princeton Junction. You can see the "dinky" behind the station on the branch to the left of the picture. Photo by Gary Stuebben, December 1975. 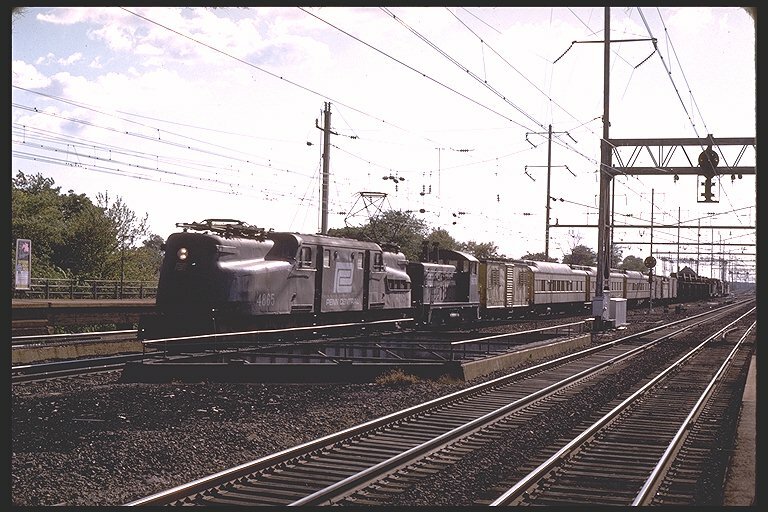 A pair of GG1s pull a general freight through Princeton Junction. Photo by Robert Staples. 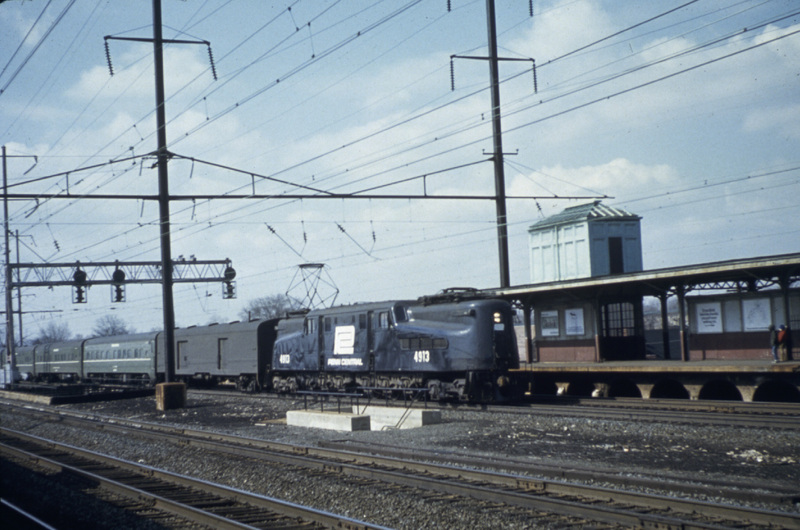 In March 1978, former PRR MP54 MU cars in service as the "dinky" sit at the station at Princeton Junction. Photo by Al Mixter. 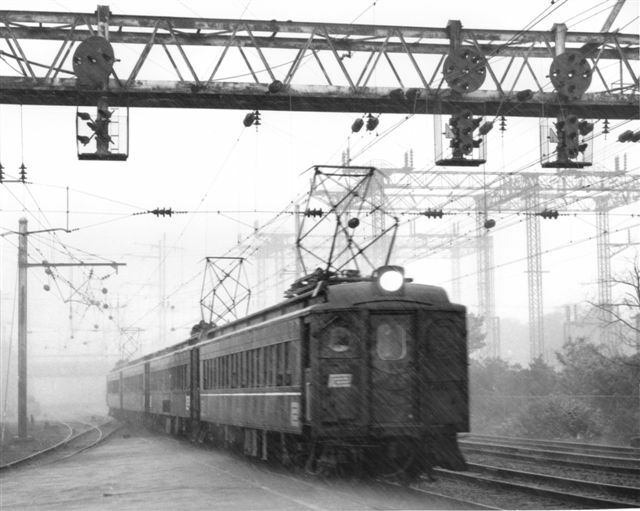 In the pouring rain, a train of MP54s pulls in for its station stop at Princeton Junction. 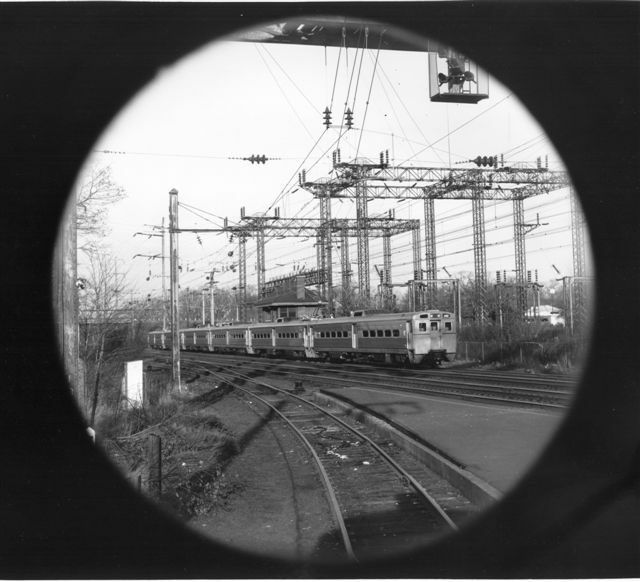 Photo by Kermit Geary, Jr.
A train of Jersey Arrow MU cars roll through Princeton Junction, as viewed from the round window of the "dinky"'s MP54 car. 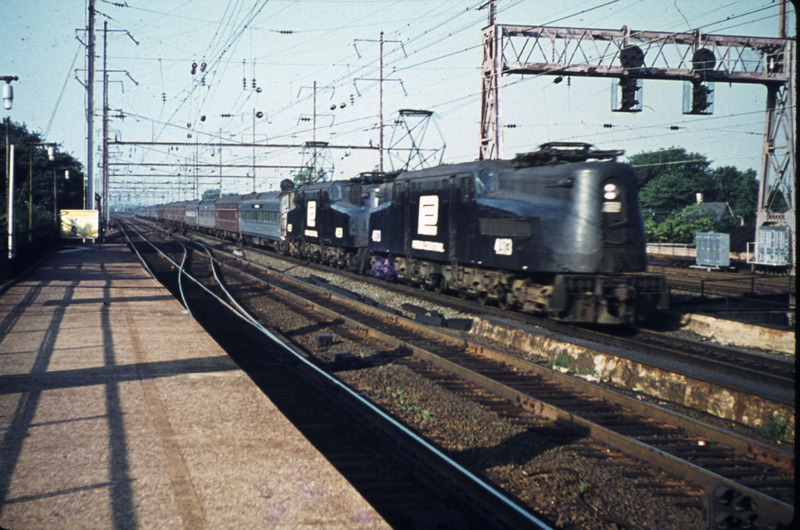 Photo by Kermit Geary, Jr.
South Amboy is located across the Raritan River from Perth Amboy, on the New York & Long Branch Railroad, the line jointly owned with the Jersey Central that provided commuter service to the north Jersey coast area. South Amboy has its own separate page. 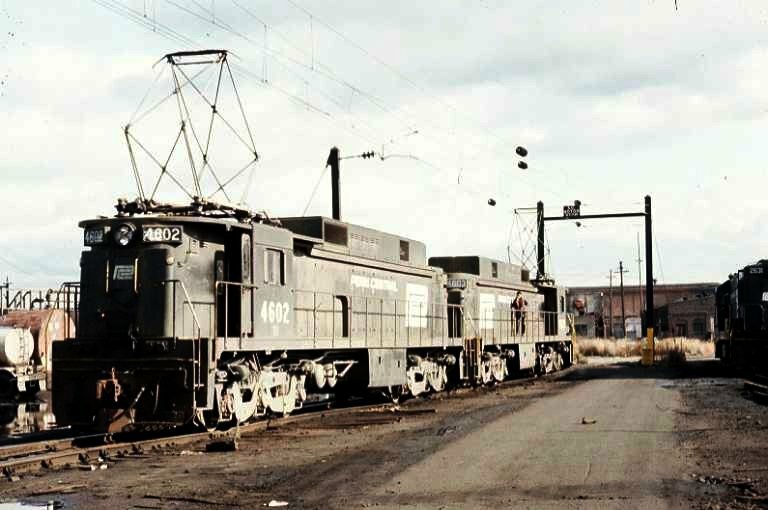 On November 22, 1975, PC E33s 4602/4603 rest between runs at Meadows Yard. Photo by Harv Kahn. 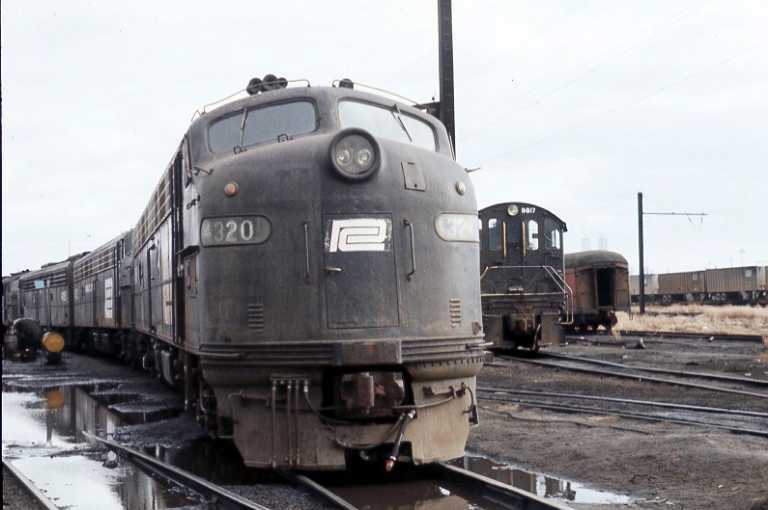 That same day also found PC E8A 4320 in the company of other power in the engine terminal while a Trail-Van train passed on the main. Photo by Harv Kahn.